Don’t expect a quantitative rout of the Belt and Road from the United States. Monday was supposed to be a big day for the United States’ Indo-Pacific economic strategy. 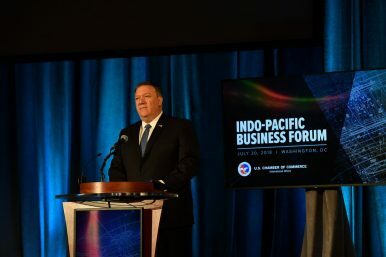 Ahead of a trip to Southeast Asia, where he will visit Malaysia, Indonesia, and Singapore, U.S. Secretary of State Mike Pompeo took a break from North Korea diplomacy to show the Indo-Pacific region that the United States was thinking strategically about the geoeconomic future of the region. Pompeo announced a $113.5 million fund in “in new U.S. economic initiatives to support foundational areas of the future: digital economy, energy, and infrastructure,” according to an official State Department release describing the new initiative. “This represents a strategic investment in deeper engagement with the Indo-Pacific while growing our own economy and creating jobs at home,” the release noted. Even keeping in mind that China’s actual capital outlays for its nebulous basket of infrastructure and connectivity projects across the Indo-Pacific under the aegis of the all-encompassing Belt and Road Initiative falls well short of the regularly bandied-out figure of $1 trillion, the U.S. sum is paltry. China, to be sure, has structural advantages in operating the way it does: for instance, Communist Party decision-makers are free to leverage the massive state-owned enterprises as a geopolitical sledgehammer, where needed. The United States does not have a comparable option. Many early reactions from Asia-watchers thus have zeroed in on the quantitative discrepancy in what the United States is putting down on the table. $113.5 million, simply put, is well short of Chinese commitments, which are in the billions. The U.S. initiative looks smaller still when its scope becomes apparent: Pompeo was introducing this fund for a range of countries. But observers should keep the bigger picture in mind. Japan and Australia are joining the United States in a trilateral infrastructure investment initiative. “The United States, Japan, and Australia have formed a trilateral partnership to mobilize investment in projects that drive economic growth, create opportunities, and foster a free, open, inclusive and prosperous Indo-Pacific,” a statement released by the Australian Ministry of Foreign Affairs on Tuesday noted. “We share the belief that good investments stem from transparency, open competition, sustainability, adhering to robust global standards, employing the local workforce, and avoiding unsustainable debt burdens.” While their partner in the “quad,” India, is absent from this initiative, these three countries are stronger with their capabilities combined. Japan, meanwhile, has been ahead of the game in many ways. In 2015, Tokyo announced the Partnership for Quality Infrastructure in Asia, sensing the long-game in China’s Belt and Road Initiative. Japan’s expertise in the strategic deployment of development assistance and loans is unparalleled. Many forget that Tokyo effectively wrote the book on this over decades with its expert deployment of Official Development Assistance (ODA). Ultimately, the headlines and topline analysis of Pompeo’s announcements may have missed the mark. If you’re waiting for the United States to begin dropping infrastructure investment numbers that rival China’s, you may be waiting for a while. Instead, what Pompeo’s speech lacked should stand out. For instance, the Trump administration continues to lack a broad approach to develop diplomatic ties across Asia. Similarly, while the language of a “free and open” Indo-Pacific hearkens to values-based cooperation, outside of the so-called “quad,” value-based diplomacy is largely absent. We may yet see more detail on this—perhaps during Pompeo’s upcoming trip—but for now, there’s still little to go on.